Who thought they'd ever see Mickelson holding the Claret Jug? When a 42-year-old veteran shot a brilliant 32 on a tough back-nine under intense pressure to win golf’s oldest major last year, few would have predicted the very next Open Championship would end much the same way. The only differences between Ernie Els’s win in 2012 and Phil Mickelson’s on Sunday were that the American was a year older than Els had been, and his victory was achieved on a parched and thirsty links baked brown by weeks of uncharacteristically dry weather, rather than the damp, unusually soft layout on which the South African had prevailed. Actually, there was one other major distinction. Els had won the Claret Jug before; ten years before admittedly, but his record at the Open Championship – 12 top-tens and eight top-fives in 21 appearances from 1992 to 2011 – suggested his game had almost been tailor-made for the British coastline. Mickelson’s game, however, often seemed allergic to the British coastline. In 19 starts from 1991 to 2012, the Californian had finished in the top-ten just twice, and even though one of the two was a runner-up finish to Darren Clarke in 2011, his play at the Open over the years had been so patchy - he missed the cut by eight shots at Lytham, and his average finish in the 15 years he had made it to the weekend was 38th - few people would have stuck their neck out and said he might actually win the thing one day. For two decades, Mickelson’s game had seemed at odds with the demands of links golf. He found the Open’s penal rough far too often to make his birdies count, and he had never been comfortable putting on fescue greens which he found a little too slow for his taste. More than that though, one got the impression Mickelson had never really relished the trip across the Pond, especially if wind and rain were in the forecast. Mickelson didn’t elaborate on why he finds it easier to keep the ball in play nowadays. Meteorologists and environmentalists might tell you different, but it’s doubtful the air has changed much in the last 20 years. What has changed a great deal in that time though is the ball which holds its line and pierces the air much more efficiently than the balata balls in play when Mickelson first came to Britain. His swing coach Butch Harmon’s input has no doubt been invaluable too, but perhaps the most significant factor in his slowly evolving relationship with links courses has been his willingness to experiment with the makeup of his bag, often giving his driver the week off in favor of another scoring club. With a 13-degree (bent to 12) 3-wood, a 17-degree hybrid, and a 4-iron to hit off the tee, Mickelson may have sacrificed a little distance last week, but he beat the field in fairways hit - averaging 61% - something he rarely does back on the PGA Tour where he currently ranks 163rd in driving accuracy. It’s not ideal perhaps for players to win majors without hitting a single driver, the most exciting and exacting club in the bag, but most felt hitting one off Muirfield’s tees was simply inviting danger. The fairways were so firm, players were getting 50-60-70 yards of roll at times, so it made little sense to risk finding the rough with a driver when you could float a simple 220-230-yard hybrid or long iron to the fairway and watch it eventually come to a halt 290 yards down the hole. Zach Johnson led after day one. A shot behind the American at the end of Thursday’s sun-soaked first round were Spaniard Rafael Cabrera-Bello and 56-year-old Mark O’Meara, the 1998 champion making his 28th Open Championship appearance. A group of five players one shot further back included India’s Shiv Kapur who had probably given himself the fright of his life by making six early birdies and reaching the turn in just 30 strokes. Mickelson shot a two-under 69, as did pre-tournament favorite Tiger Woods who followed a disappointing outward 37 with a stellar 32 coming home. Though 20 players managed to break the par of 71, and the average score for the 153-man field (Louis Oosthuizen, Peter Hanson and Alexander Noren withdrew) was 74.54 – not excessive for the first day of a major – the R&A fielded a number of complaints on Thursday evening from players who were concerned the course was becoming too firm and fast. Most vociferous among the group who ignored Jack Nicklaus’s successful strategy of letting his competitors complain away their chances of winning were Ian Poulter who said the Open had ‘turned into crazy golf’ and that the 18th green should have a ‘windmill and clown’s face’, and Mickelson who expressed his hope that the R&A would ‘let go of its ego and set the course up the way the best players can win’. Johnson, who in June had criticized the USGA for its set-up of Merion saying it had manipulated the US Open venue to prevent low-scoring, chimed in too saying some of the pins were becoming ‘dicey’. Peter Dawson, Chief Executive of the R&A seemed largely unmoved by the comments, remarking that he was happy with the scoring and that Poulter had finished with three bogeys in his last four holes so was ‘hardly likely to be in the best of moods’. Mickelson and Johnson’s observations obviously carried a little more weight, however, as the greenscrew was indeed given the order to douse the putting surfaces in preparation for the second round. Friday saw plenty more sunshine and 80-degree temperatures. But an east wind, the opposite of what players had faced in practice and during Thursday’s opening round, made scoring extremely challenging. Only four players would break 70, two of them playing with gay abandon having failed to break 80 the day before. At four-under-par through 31 holes, Argentina’s man for the big occasion, Angel Cabrera, looked like he might be on his way to major number three, but we didn’t see much of him again after three late bogeys. The round really belonged to two Europeans - England’s Lee Westwood who rebounded from a mediocre 72 in the first round with a best-of-the-day 68 that took him into a tie for second on two-under 140, and Spain’s Miguel Angel Jimenez who shot a morning 71 then spent a happy afternoon watching his fellow competitors trying but failing to come to terms with Muirfield’s concrete runways and granite greens and match his 36-hole score of three-under 139. Jimenez entertained reporters at his Friday press conference. It was the first time the 49-year-old from Malaga had ever held the halfway lead at a major. But, not surprisingly for a man with 19 victories from 24 full seasons on the European Tour, eight top-ten finishes at the majors, 10 appearances for his country in the Dunhill Cup, 13 in the World Cup and 11 for his continent in the Ryder Cup, Seve Trophy, and Royal Trophy, and for a man often jokingly referred to as the ‘Most Interesting Man in the World’, he was taking it all in his stylish and composed stride. “It's much better to feel when you were on the top of the leaderboard than when you were somewhere else on the leaderboard, no?” he asked reporters in his broken English. “Obviously it's much nice, no? With a level-par 71 of his own, Woods climbed into the tie for second on two-under 140, alongside Westwood, Sweden’s Henrik Stenson who had opened with matching 70s, and Dustin Johnson who finished tied for second at Royal St George’s in 2011. On one-under were Cabrera, Cabrera-Bello, first-round leader Zach Johnson, and Scotland’s Martin Laird. Mickelson shot a 74 that included a four-putt double on the 16th to fall to one-over-par, four behind Jimenez. Five senior golfers used their savvy to make the cut which fell at eight-over 150 - O’Meara (145), Tom Lehman (145), Sandy Lyle (148), Fred Couples (149), and Peter Senior (150), while notable names to miss out on the weekend were Luke Donald (152), US Open champion Justin Rose (152), Tom Watson (153), Thorbjorn Oleson (154), Rickie Fowler (154), Rory McIlroy (154), Matteo Manassero (157), and Sir Nick Faldo (157). As had been the case on Friday, no one went lower than 68 on Saturday with South Africa’s Richard Sterne, Spain’s Sergio Garcia, and Hunter Mahan all signing for hard-earned three-under-par rounds. Mahan’s effort was good enough to shoot him into a share of second place on one-under-par with Woods (72) who, not for the first time, was complaining of not getting the scores he thought his good play deserved. Two clear at the top of the leaderboard was Westwood whose one-under 70 included an eagle three at the 5th and who would now be seeking to not only collect his long-awaited first major win, but also do his part for England/Britain’s great summer of sport which so far included the first men’s singles title at Wimbledon in 77 years, two cricket test match victories over old foe Australia, and the leader in the Tour de France. 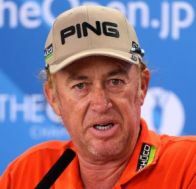 Unfortunately for the press which had enjoyed his hilarious Friday press conference tremendously, Jimenez fell out of the spotlight with a 77. But at least prospects of a nice redemption story increased when Adam Scott, who had made four bogies in a row to finish the 2012 Open and lose by a shot to Els, shot a third-round 70 to complete 54 holes on even par 213 and move into fourth place. Also in contention heading into the final round, though four shots behind on 214, were Stenson, Cabrera, Zach Johnson and Ryan Moore, while Mickelson (72) was lurking a further shot behind alongside Francesco Molinari (72). Shortly after finishing his third round, Mickelson was asked about his chances the following day to which he replied he might only be three shots behind the leader, and therefore well-placed. Anything in the 60s, he said, would probably be good enough. As it turned out, he was actually five back by the end of the day, and something nearer the mid-60s would probably be required. For the first time all week, Sunday’s skies were a little overcast, the temperature 15 degrees or so cooler than it had been on Thursday and Friday. It meant that though the course was still extremely firm it might have retained enough moisture for somebody to get after a few pins and post a number that would get the leaders’ attention. Front nine scores among the contenders were mixed. Mahan shot 37 as did Molinari. Woods more or less blew himself out of it with a two-over 38 that did nothing to dispel fears that his poor weekend play at recent majors is more of a trend than a blip. Johnson Z. made nine straight pars for a 36. Others were making progress, however, among them Ian Poulter who had begun the day tied for 19th on five-over-par but gone to the turn in 34. After starting home with three straight birdies, he went to five-under for the day and level-par for the tournament. 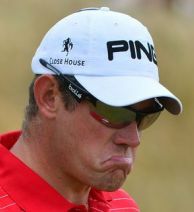 Another disappointing finish for Westwood. Early in the back nine, two players emerged as front runners, however, first Stenson who got it to one-under for the tournament through 11 holes, and then Scott who made it to two-under thanks to a four-under-par stretch in five holes from the 7th. Westwood meanwhile went out in 38 to reach the turn at one-under and continued to backslide on the inward nine. After bogeys at the 13th and 16th, it was clear the quest for that elusive major would have to be rejoined at Oak Hill next month. Mickelson made a decent move on the front shooting 34, but was still a shot or two behind Stenson and Scott entering the back nine. The Aussie made a hash of the short 13th, however, hitting his tee shot way right and winding up with a four that triggered another disastrous run of four straight bogeys. Having won the Masters between the twin bogey runs of 2012 and ‘13, the significance of this ugly sequence was perhaps not quite as profound as that of the first. But who knows how, or if, two such calamities in successive years might prey upon Scott’s mind at future Opens? Mickelson’s victory seemed entirely appropriate on a course whose previous seven champions are all members of the Hall of Fame. And it gave him his fifth major victory confirming his place among the greats of the game, and putting him alongside a quintet of immortals comprising JH Taylor, James Braid, Byron Nelson, Peter Thomson and Seve Ballesteros, the mercurial Spaniard whose exceptional gifts were obviously passed down to the equally dazzling but unpredictable Mickelson. He now needs just the US Open to complete the Grand Slam and join an even more celebrated list of players – Nicklaus, Woods, Gary Player, Ben Hogan, and Gene Sarazen. “I think if I'm able to win the U.S. Open and complete the career Grand Slam, that's the sign of the complete, great player," Mickelson said. "I'm a leg away. And it's been a tough leg for me." With six runner-up finishes at the second major of the year, the most recent of them coming five weeks ago when he finished two behind Justin Rose, ‘tough’ would seem a bit of an understatement. But then, until last Sunday, the Open Championship hadn’t exactly been easy for him.